By Łukasz Białek - MD and Bogna Haponiuk. What are the causes of neutropenia? What is the Absolute Neutrophil Count? The ANC calculator (Absolute Neutrophil Count calculator) is a tool that enables you to estimate the total count of neutrophils in the blood, which is useful in the assessment of the risk connected with infectious conditions. An example of this is sepsis in patients undergoing chemotherapy. It allows for quick diagnosis of neutropenia - a condition when the number of neutrophils in blood is substantially lowered. In this article, we will describe what are neutrophils and what happens when their concentration in the blood significantly drops - neutropenia. Wondering what may cause this? We have also answered this question and explained how neutropenia is treated! The indicator in evaluating neutropenia is Absolute Neutrophil Count (ANC). In this article you will learn more about ANC and how to interpret its result. You will also find out what the ANC formula is. If you are interested in medicine, check out our dosage calculator which estimates the dose of any medication based on your weight, or the GFR calculator , helping you find your glomerular filtration rate and helps you diagnose kidney malfunction! Neutrophils are the most numerous subpopulation of granulocytes and white blood cells. They are produced from the stem cells in bone marrow together with other granulocytes such as eosinophils , basophils and agranulocytes - lymphocytes and monocytes. Every human produces approximately 1011 neutrophils daily [sic!] which live only for a few days. Some of the neutrophils leaving bone marrow are so-called band neutrophils or band cells. These are cells which, although still immature, are just one step away from becoming fully matured segmented neutrophils. An increased level of band neutrophils, so-called bandemia or left shift, are the markers of increased production of white blood cells and the release of more white blood cells from bone marrow to bloodstream. This happens most often due to infection or inflammation of another kind. Neutrophils are an essential part of the immune system, specifically innate immune system. Their primary task is to participate in phagocytosis. They are recruited to the site of injury within minutes following the beginning of the acute inflammatory process resulting, e.g. from the bacterial infection. Neutrophils migrate then from blood vessels to the interstitial tissue, where they phagocyte (kill and eat) bacteria. Together with bacteria, neutrophils are the main component of pus. Neutropenia is defined as a low neutrophil count. Generally accepted reference range for neutrophils is 1500 to 8000 cells per microliter (µl) of blood. However, most healthy people have more than 2000 neutrophils per microliter of blood. The lower the neutrophils, the more severe the neutropenia and the more probable complication are and the more dangerous they can be. When may you suspect neutropenia? The most important sign is vulnerability to infections, especially severe or recurrent bacterial infections of the skin, perirectal area or mouth. Also recurrent pneumonia is typical in patients with neutropenia. People with low absolute neutrophils often suffer from ulcers, abscesses, swollen gums and mouth sores. They also very often present with feverishness or low-grade fever, but also hypothermia is relatively common for these people. Keep on reading to learn more about cancer-induced neutropenia and other causes of neutropenia. Yemenite Jews and other populations, including Ethiopian Jews and Bedouins, naturally have low neutrophil counts, and this condition is called benign ethnic neutropenia because it is not associated with an increased risk of infection. Elsewhere neutropenia can be a hereditary disease (so-called severe congenital neutropenia) or it may develop as a symptom of a disease or a side effect of a treatment. hypersplenism (increased destruction of blood cells by the spleen because of its hyperfunction). Regardless of the primary reason, you should always remember that neutropenia can be life-threatening due to its complications and, if you show symptoms of it, you should consult your doctor! Absolute Neutrophil Count calculates total number of neutrophils, both mature and immature in one microliter of blood. Measurement of ANC are vital in many clinical situations. First of all, it is mandatory in diagnosing and classifying neutropenia. You cannot diagnose neutropenia without counting ANC! ANC is also a measure of risk of infection, including severe and life-threatening infections like sepsis. Additionally, the diagnosis of neutropenia imposes an obligation on the doctor to actively seek possible severe complications and try to prevent and treat them. Moreover, patients with such conditions should not receive certain drugs, so the administration of these will be ceased. That is why using the ANC formula and calculating absolute neutrophils is crucial. percentage of immature neutrophils (called bands). Simply input all of these numbers into the ANC formula to calculate the Absolute Neutrophil Count. The result, ANC, will also be measured in cells/μL. Check out our other calculators that rely on the the complete blood count (CBC) results: Absolute Reticulocyte Count and Corrected Reticulocyte Count! Do a complete blood count (CBC). Remember that the results should be as recent as possible. Note down the number of white blood cells (WBC) per microliter. Let's assume it is equal to 6000 cells/μL. Write down the percentage of mature (segs) and immature (bands) neutrophils in your blood sample. Let's assume the percentage is equal to 30% for segs and 3% for bands. Compare the results against the following five interpretation rules. Category 0: ANC higher than 2000 cells/μL. This is the reference range - in typical adults, ANC ranges from 2000 to 8000 cells/μL. Category 1: ANC between 1500 and 2000 cells/μL. Category 2: ANC between 1000 and 1500 cells/μL. This is the condition of mild neutropenia. Category 3: ANC between 500 and 1000 cells/μL. This is the condition of moderate neutropenia. Category 4: ANC below 500 cells/μL. This is the condition of severe neutropenia. You should always remember that the value of ANC changes dynamically and reflects the patient's response to chemotherapy treatment or marrow transfer. It is often measured daily to assess whether the patient should receive additional antibiotics or bacteria cultures. How you manage neutropenia depends on its severity as well as the primary cause. Treatment is usually mandatory in the case of severe neutropenia. The treatment of choice in drug-induced neutropenia is discontinuation of the administration of the drug or, in cases of chemotherapy-induced neutropenia, lowering the dose of the drug. In other cases a treatment called granulocyte colony-stimulating factor (G-CSF) is used. This agent stimulates the production of every kind of white blood cells, in a bone marrow, including neutrophils. This method is used to treat many different kinds of neutropenia, including neutropenia induced by chemotherapy and radiation therapy. In some cases of severe bone marrow aplasia induced neutropenia, stem cells transplantation is required. avoiding undercooked meat, raw fruits, vegetables. You should always remember that the primary objective in the management of patients with neutropenia should be to prevent possibly life-threatening complications. Severe neutropenia accompanied by a rapid onset fever is a medical emergency requiring immediate attention and treatment. Febrile neutropenia is generally defined as a rise in axillary temperature to above 38.5 °C for more than one hour while having an absolute neutrophil count of fewer than 500 cells/μL. Other definitions are also used, like having an axillary temperature exceeding 38 °C during one to four hours with severe neutropenia. Every second patient with such a condition already has an infection and 40% of them have a detectable bacteremia (presence of bacteria in the blood) what may lead to the development of neutropenic sepsis. It is one of the most common life-threatening oncological emergency, as it usually appears during chemotherapy. In the early 1980's it was recognized that, among other treatments, early administration of broad spectrum antibiotics would greatly reduced the mortality rate of patients with neutropenic fever. Nowadays, antifungal agents are often added to the treatment of febrile neutropenia. Administration of these drugs is usually discontinued when ANC > 500 cells/μL and fever abates. Neutropenic enterocolitis (also called typhlitis or cecitisis) is an inflammation of cecum (a part of large intestine) associated with infection in a patient with low absolute neutrophils. Typhlitis should be suspected in a patient with neutropenia who reports diarrhea, bloating, abdominal tenderness, nausea or vomiting. It is usually diagnosed with computed tomography. The treatment is based on antibacterial treatment and surgical treatment in cases of intestinal perforation. Łukasz Białek - MD and Bogna Haponiuk. 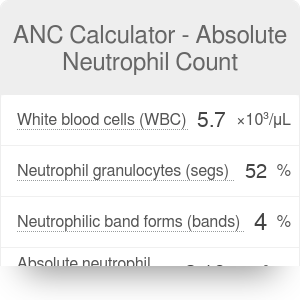 ANC Calculator - Absolute Neutrophil Count can be embedded on your website to enrich the content you wrote and make it easier for your visitors to understand your message.